James DeGale scored two knockdowns en route to outpointing Andre Dirrell to earn the vacant IBF super middleweight title on Saturday in Boston. The 29-year-old London native, who dropped Dirrell twice in Round 2, won by scores of 117-109 (which was too wide in the opinion of most observers), 114-112, 114-112. DeGale (21-1, 14 knockouts), who won a gold medal in the 2008 Olympics, was the aggressor during the first half of the bout, which was televised on NBC in the U.S., but Dirrell, a 31-year-old 2004 Olympic bronze medalist from Flint, Michigan, pressed the fight from Rounds 7 through 10. 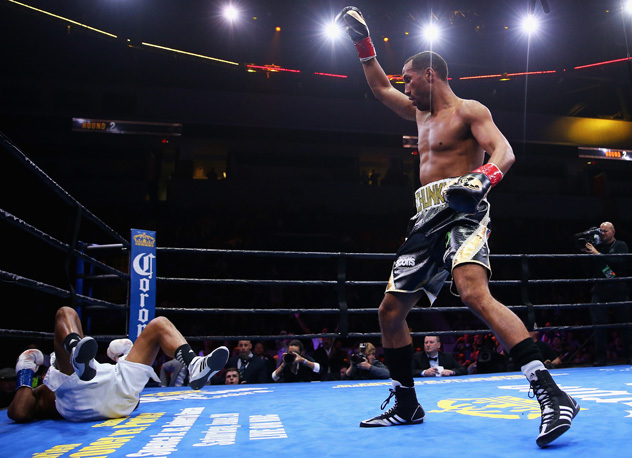 However, DeGale stepped it up in championship rounds and landed the harder punches in the final six minutes of the bout. In earning the IBF belt vacated by Carl Froch, DeGale became the first British Olympic boxing gold medalist to win a major professional title. A full report from Boston will be posted shortly. BOSTON – Every so often the “Fat Kid” arises. The one they call “Chunky.” It’s an inner button that James DeGale can always push, shoving against the taunts and cracks he would sometimes get in his youth as a somewhat overweight 10 year old trying to change his life’s direction by going to the gym. It’s what DeGale reached down and found in the championship rounds against Andre Dirrell on Saturday afternoon at the at Agganis Arena on the Boston University campus, to become the first British Olympic gold medalist to win a major world title. DeGale (21-1, 14 knockouts) seized the vacant IBF super middleweight belt by beating Dirrell (24-2, 16 KOs) by scores of 114-112 on judges Howard Foster, of England, and Dan Fitzgerald, while Canadian judge Alan Davis had it 117-109 for DeGale. THE RING scored it for DeGale, 114-112. DeGale, the 2008 Olympic middleweight gold medalist, scored two knockdowns in the second round and had Dirrell in trouble. But Dirrell fought back to make it close. There was a lot of trash talking in the ring – but not too much afterward. DeGale left for the hospital to get stitched up, and Dirrell gave a terse comment and was too angry to speak to the press. It’s a shame, because the fight was a good back-and-forth tilt. DeGale had his way in the early rounds, and landed a total of 115 of 400 punches (29-percent) to Dirrell’s 111-of-488 (23-percent). But in the late rounds, it was Dirrell coming forward and cornering DeGale. On the undercard, Worcester’s Edwin Rodriguez (27-1, 18 KOs) impressed a partisan crowd with a third-round stoppage over the previously undefeated Craig Baker (16-1, 12 KOs). Referee Robert Benoit stopped it at 2:22 into the third round because Baker couldn’t answer when Rodriguez hit with a barrage of punches. “It was a little easier than I thought,” Rodriguez said. “He came in undefeated and I thought I was having an easy time with him. Every fight, I try to improve and get better and one thing I wanted to do in this fight is work better behind my jab and punish (Baker) with body shots. When I had him hurt, I stayed focused with continued with the jab. I didn’t go crazy. He wasn’t fighting back and I knew I hurt him with a straight right. I think I looked good. I won on national TV and I deserve a big fight. I want Sergey Kovalev, Jean Pascal, Adonis Stevenson. I think I deserve a title shot. I know I can compete with anyone at 175. Baker, of course, disagreed with the stoppage.